Do away with tedious and time-consuming spreadsheets and error-prone manual journal entries. Enjoy enhanced business intelligence and insight through automated period-end allocations by AcctTwo. Flexibility - Allocate to multiple dimensions at once with unlimited dimension filters. Automate reversals. Allocate groups of accounts at once in a single allocation. Allocate directly within your GAAP accounting books or to separate management reporting books. Ease of Use - Create your allocations quickly with a simple single page user interface. Run all of your allocations at once, in sequence, so that results can be used by subsequent allocations. Error reduction - Speed up period-end processing while increasing accuracy by minimizing manual processes and offline spreadsheets. 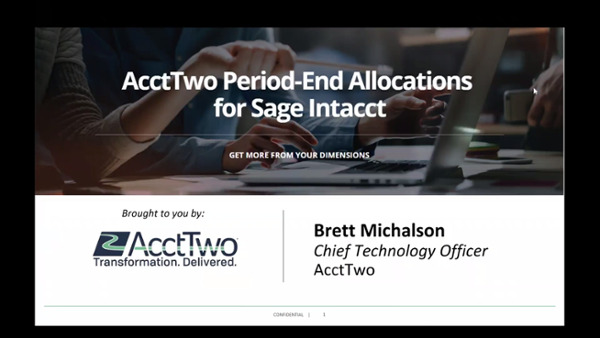 Seamless integration - The AcctTwo Allocations module is built on the Sage lntacct platform and natively integrates with Sage lntacct like any add-on module.